Kate Linnea Welsh: Christmas Cookie Recipe: Butterballs! This is an old family recipe (only slightly adapted) that I make every year; I made it for a cookie swap last weekend and posted this picture, and a few people on Twitter/Facebook/Instagram asked for the recipe. So here you go! 3. Form the dough into a ball and refrigerate for at least an hour. 5. 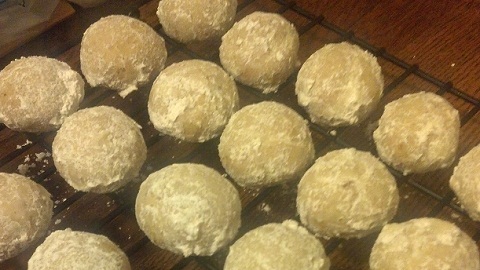 Roll the cookies into one-inch balls. 6. Bake on an ungreased cookie sheet for 10-12 minutes or until slightly golden. 7. While the cookies are still hot, roll each one in confectioners sugar to coat. * I know the default for baking is unsalted butter. But I also know that my mom has always used salted, so that's what I use for this recipe. ** Okay, I no longer actually chop the pecans, because I don't have one of those nifty nut chopper things like my mom does. I now grind them instead, into something somewhere between a meal and a paste, and my brother and I actually like them better this way - the pecan flavor is more infused throughout the cookie. I've done this with both a food processor and a stick blender; both work but the food processor works better.